A few days ago Jakki sent me a link to a jigsaw ap and we have both been pretty much addicted. Thank goodness it is the holiday. Today however Nij and I did a real jigsaw. we have always loved doing them and this was fun. Although it was 1000 pieces it was actually a very simple one to complete. We have some real tough ones we have done. I have such a great photo of the day today - I really and truly do. Today is a once in every 4 years sort of day. I don't really want to have the past three weeks ever again in my lifetime let alone in 4 years time. But today is a good good day and the photo of the day is great. Not great because I am in it but because of what it says and what I can celebrate. I finally finally got my results today. After not hearing and then ringing constantly and being told there was a hold up in histology etc etc and meeting with a rather unhelpful secretary I finally got them and they are all clear. The dreaded result didn't happen and I can't begin to explain how I feel. Thank you to my many many friends who read here daily who have sent so many message of support and encouragement whilst I was going through the tests and the wait. And it really has changed me. The whole thing. I really am trying to savour each and every day. I really am trying to live rather than plan. And I really am truly grateful for this life. So many people have such truly awful things to deal with, such awful tragedies to face and I am very very lucky and extremely blessed. I have always tried to see the positives in life but I can tell you what, having a wake up call really does put things into perspective. I have to go out to a meeting shortly but even that feels absolutely fine! The page I am sharing today is another art journal page which, this time, was all about layers. I was aiming for a look a poster on top of layers so I made the poster first then put it down on lots of layered things. Sort of worked, but not completely. I still feel I haven't got the hang of this art journal stuff. The windshield wipers scraped aside the morning sleet. Miles of red glowing taillights lined Route 50 leading into Washington, D.C. This was part of my daily routine: Each day I woke up, inched through traffic, worked eight hours, sat in more traffic, walked my German shepherd, Kai, and went to bed. I was single and 22 years old. The year before, I’d dropped out of college. God, I prayed, isn’t there more to life than this? I’d grown up in a small Minnesota town. But I had fled from the miles of cornfields by transferring to a college in the D.C. area. After a year in the city, I didn’t know what to do with my life or where to live. That weekend, Kai and I walked along a leaf-littered trail. The breeze caressed my cheeks and the sun warmed my back. Kai bounded ahead and splashed into the creek. All he wanted was to be with me, playing outdoors. I ached for my life to be that simple. I sat on a boulder and Kai paddled over with a gift, a rock. I tossed it into the water. He dove after it, expecting adventure. Adventure—that’s what I need, I thought. So why am I living here? My dream had always been to work outside, preferably on horseback. I thought of my brother Chuck, who lived in Montana. Peace overwhelmed me when I remembered horses grazing under ponderosa pines on Rocky Mountain slopes. It was almost as if God’s still, small voice was urging me to plunge into a new adventure. Ok so it is a day of total and utter commercialism. It is a day when flowers and chocolates rocket in price, when eating out becomes a nightmare as it is so busy and overly sentimentalised. And it doesn't hurt to have a special day - now does it. Nij and I exchanged cards as usual, but I had an extra special treat alongside breakfast. Nij had bought some lush valentine cup cakes. Apart from the fact they were gorgeously yummy, it was just such a thoughtful gesture. So they are my photo of the day. There was only one thing to do after injesting that many calories - a nice long walk along the beach. It was much milder today and the sun was really restorative. All in all a lovely morning. Follow it up with a bit of Loose Women over lunch and an afternoon scrapping and you have a pretty good Valentine's Day actually. I finally managed the doodling art journal page. I had been putting it off as I wanted to keep it digital as the rest of the journal is but I also wanted to doodle by hand. I ended up doodling by hand and scanning the doodles in and then supplementing them with some of Dawn's amazing Zentangles. They are from her kit called Tinker which is amazing and on sale at her Scrapbookgraphics store. It was even themed for today LOL. This LOL cat made me giggle like mad. Just my sort of humour. and my one minute devotional today is superb. I am loving this calendar and this is a great thought for today. I happened to be writing a note with a red magic marker, and on impulse, I picked up Mandy’s speckled hand and drew a heart around one of her pock marks. She smiled. I drew another heart. She giggled. For the rest of the day she admired her hearts. That night, after we had drawn pictures of snowmen with chicken pox and made up stories about animals with chicken pox, Mandy squeezed my neck tightly. “This was the best day ever,” she whispered. I kissed a smooth patch of skin on her hand—between two hearts. Today, remembering that incident, I’m reminded of a wise friend who said problems are opportunities for growth and change. When I think how much I disliked the traveling job my husband had when we first married, I see I became much more independent and self-sufficient as a result. When our basement had to be gutted because of a flood, we liked the remodeled version much better. It’s not that I want problems. But when they come, it seems I have two choices. I can be miserable and rail against them, or I can, in a sense, draw a heart around them and turn them into opportunities for growth and learning. Who knows? I might even end up having one of my best days ever! An interesting photo of the day today as it is something that happened today but really didn't happen today. I'll explain. I decided, for my sins, that it would be helpful for me to do a counselling course as I seem to do a great deal of counselling as part of my routine day. So I duly surfed, registered, started, studied and completed. I finished the last assignment before term started and heard I had passed ... with model answers no less ... a couple of weeks ago. But the certificate arrived today so that is the photo of the day. I think it will be a while before I do any more studying. I remember when I did my M Ed a few years ago. I kept thinking how much free time I would have once it was finished. Now I look back and think that, as I frequently work 12 - 14 hour days, how the heck did I fit in doing very intensive high powered study for my Masters degree. I know one thing, I sure as heck couldn't do it now. I have some new scrapping to share today and it is another art journal page. I think I am quite liking making an art joirnal - art for arts sake. Good enough for me. The challenge for week 4 was to cut out lots of words from printer material like magazines, books etc and then create the journalling. I was determined to try and stick to the spirit of the challenge and it was a really hard one to do digitally and took ages and ages. But I managed it and was pleased with the message and the look of the page. And the LOL cat today made me giggle as it is NOT going to be me! I grew up with dogs, lots of dogs. My father was a hunter and liked to keep several hunting companions, especially beagles. He often bred them and sold the puppies, sometimes keeping the pick of the litter for himself. His favorite, Cyclone, had just given birth, and the puppies were beautiful: big, healthy, playful, and keen on sniffing out everything in their paths. “I’ll write it!” I volunteered. I had dreams of being published someday, and the classifieds seemed a good place to start. I wrote several drafts of the ad; the final version went to great lengths expounding on the virtues of the pups, predicting what fine hunting dogs they would become, and even mentioning how happy they would make their future owner. O God, You are the giver of every perfect gift. Open our eyes to the wonders and riches in our lives that we may have overlooked. I guess we all need to dream at points - and I don't just mean the sleeping sort of dreams, I mean the wakeful sort, the day dreams that usually make us smile. We need those moments in our lives. Some days more than others. I have a great respect for and fascination for Native Americans. I love learning about their culture, learning about their tribal traditions and heritage and learning about the wonderful art they create. And I love teaching about it too. And so my photo of the day links the two random thoughts together - a display of handmade, handmade today actually, dream catchers. They are way too cute and were great fun (and quite a lot of hard work) to make. I couldn't get my act together much over the weekend to do any scrapping of any real magnitude, but I did enjoy making another page of my art journal. Do you know, I never thought I would say that. I really and truly didn't. But I am finding the UKS Art Journey very therapeutic and strangely liberating. The prompt this week was to be inspired to create from packaging. I looked around and didn't have a lot of packaging to be honest, other than in the candle and air freshner cupboard! Oh yes - there is a whole cupboard. I LIKE smells - nice smells. I am actually quite fussy about the smell. It needs to smell of 'clean' and so I like candles of fresh linen, clean cotton, coconut and vanilla. In the winter I burn candles of cinnamon and cupcake and frankinsence. I also use the plug in air freshners. I think it stemmed from having cats and being terrified my house would smell of animals. I am assured by everyone that it doesn't but as I was worried about it when we had our first cats,m that's when the candle obsession started. And this is my one minute devotional calendar today - I really like this one. Before going to a friend’s house last night, I gave myself a manicure. I was taking a gift, but I couldn’t wrap it till the polish dried. I couldn’t get dressed, either, or work on my hair. I stood in the bedroom, fanning my hands in the air, helpless without them. Hands. Those miraculously designed tools I used this morning for everything from hammering a picture hook into the wall to tying my shoelaces. Sensitive, strong, flexible, adaptable, surely the human hand is one of God’s most awesome creations! Our life stories could be told as the record of what our hands have touched. These hands have held babies and washed dishes and worn rings, held flowers and pencils, scrubbed floors and gripped the hands of strangers. What if they could do none of these things? I have a paraplegic friend whose fingers are curled against his palm. Watching him struggle just to hold a spoon or turn the page of a book, I think I’ll never again take for granted the matchless dexterity of “ordinary” hands. But, of course, I do. Within an hour, mine are performing a hundred needed functions quite unnoticed. Until, that is, a coat of nail polish interrupts their activity long enough to remind me that hands are also active when they’re folded in a prayer of gratitude. I guess life is about balance. You weigh up the good and the bad and some days the balance tips one way and sometimes it tips the other and sometimes, within the course of a day it swings from one side to the other with no real rhyme or reason. So let's not dwell on the negative swing today - positive thinking is the best healing in the world anyway. Let's look at the positive. When I came home from work - sadly early again :( - there was a brand new shiny fridge in situ. It's not on yet as we have to wait six hours before switching it on, but it looks very smart. It is all silver and shiny and there are lots of different shelves and drawers and stuff. We are, quite sadly, very excited about the switch on later. Heck, based on past form we'll just be glad if it cools. Photo of the day - fridge inspection. I have something very different to share today - very unusual for me and a totally new departure. UKS are having an art journal journey. I have never really 'got' art journals. They are generally not my style and the only ones I had ever seen were paper based and by their very nature not something I would ever do as it was messy and involved paint and gesso and glitter and ink and stuff. So totally not me. However, it was made clear there are digital art journals and that this is fine too. And looking on digital sites - wow - there are loads of them. I am not sure I am 'free' enough or 'creative' enough for this art form, although everyone says there are no rules and whatever you do is fine because it is you. However, I figured you never know if you don't try. So on Sunday I did try and this is my first ever art journal page. I'm not sure quite how I feel about it. However, I am determined to try and make myself a digital art journal exploring my creativity. We'll see eh! What I will say is that I was very touched by the generous comments everyone made on the boards. 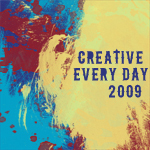 My one minute devotional calendar is, appropriate to today, about art and life. But when I grew up and had my own home, I found myself monitoring the trends portrayed in glossy decorating magazines. Before long I was succumbing to them. Better not paint the family room buttery yellow; hunter green is in this year. And Use an antique Hoosier kitchen cabinet for a desk? What would the neighbors think? Then one day this year, when I was out shopping, the craziest notion came to me: Buy a coloring book and a big box of crayons. Before long, I wasn’t just coloring leaves purple; I was coloring outside the lines. And enjoying every minute of it! As I ignored the rigid rules of Coloring 101, I experienced a wonderful new freedom. Suddenly the world looked full of endless possibilities. When I nailed antique wooden shoe forms to a board to create a one-of-a-kind hat rack, I received compliments galore, a few of them even from the neighbors. Armed with newfound confidence, I retrieved that forgotten Hoosier cabinet from the garage, scooted a ladder-back chair up to its porcelain top, and had the most serviceable desk ever. Its little drawers are ideal for housing pens and paper clips. This year I’m celebrating both my Creator and my God-inspired creativity … and coloring outside the lines every step of the way. Thank You, God, for the wondrous world You created. Help me to be fearless in beautifying my little corner of it. I just thought that was so apt for today - funny how that happens isn't it!